Vietnamese New Year is celebrated according to the Luna calendar. China and many Asian countries interpret the lunar calendar the same way, and that’s why dates of celebration are similar. Lucky you are, if you can visit Vietnam during this amazing and extraordinary holiday! This holiday is called «Tet»: it is the shortened form of «Te’t Nguyen Den» in Vietnamese and it means «Lunar New Year». The 1st of January is just a formal holiday in Vietnam; for example Catholic Christmas is the same for most Russian people. Tet, on the contrary, is the most important and the most favorite holiday in Vietnam. 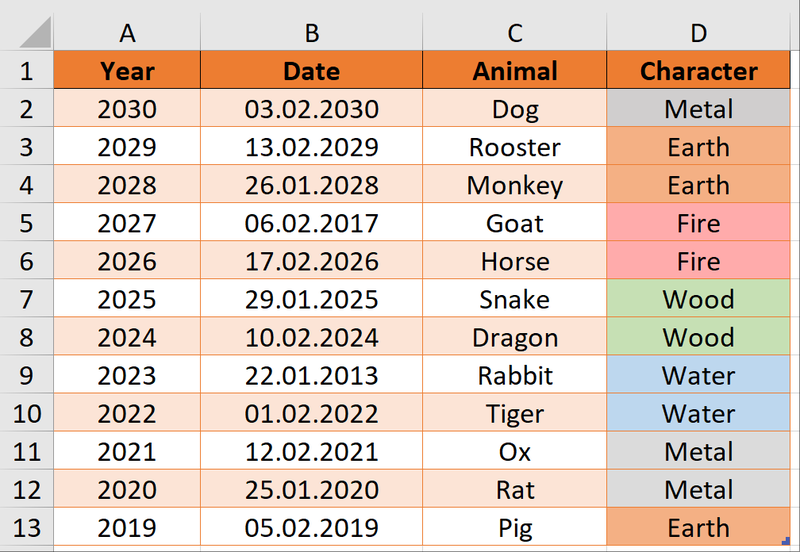 Below you can check dates, animals and elements of the Vietnamese New Year from 2017 to 2030. 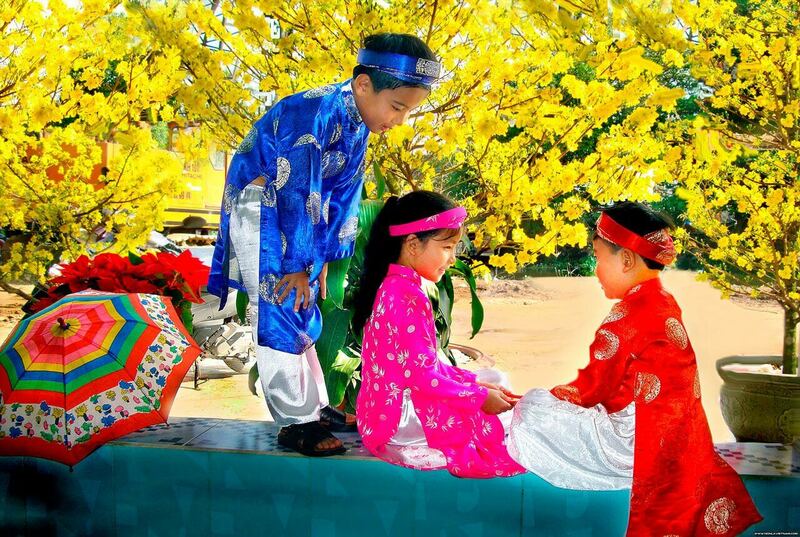 Tet is a very old holiday, and people in Vietnam decorate everything according to ancient traditions. During Tet, like during other Vietnamese holidays, people decorate streets, offices and houses, and the most popular color is red. You might find it strange, but even a bride wears a red dress in Vietnam very often. Also people always eat a red watermelon during New Year holiday – it is a symbol of luck for the coming year. Everything is red all-around on holidays. Red color is the symbol of celebration. Houses are decorated with red ribbons and lanterns, there are flower pots with tangerine trees at the entrance of any house. A tangerine tree is also a historic symbol of New Year holidays in Vietnam – it was imported into the country from China many centuries ago. The translation of the word «tangerine» sounds like «luck» in Vietnamese, that’s why all people in Vietnam place the pots with tangerine trees in front of the houses for good luck. Houses are decorated with red and yellow ribbons and lanterns. All offices in big international companies are decorated with these trees. To tell the truth, fruits are absolutely inedible on the trees – they are very sour. Trees must stay alive for a long time the whole New Year holidays and they are planted in greenhouses only for decoration, not for eating. There are signboards with words «chúc mừng năm mới», it means «Happy New Year». You can see these signboards everywhere, in cities, towns and small villages. In every Vietnamese family global shopping begins before New Year holidays. All malls, big supermarkets, shops and markets are full of people. Any goods are acquired: sweets, flowers, fruits and vegetables, souvenirs and clothes. You can hear drumming in every yard from time to time: Vietnamese youth organizes dancing, they are dressed up like dragons. They believe that such dances ward off evil spirits from their houses and protect their families from evil. 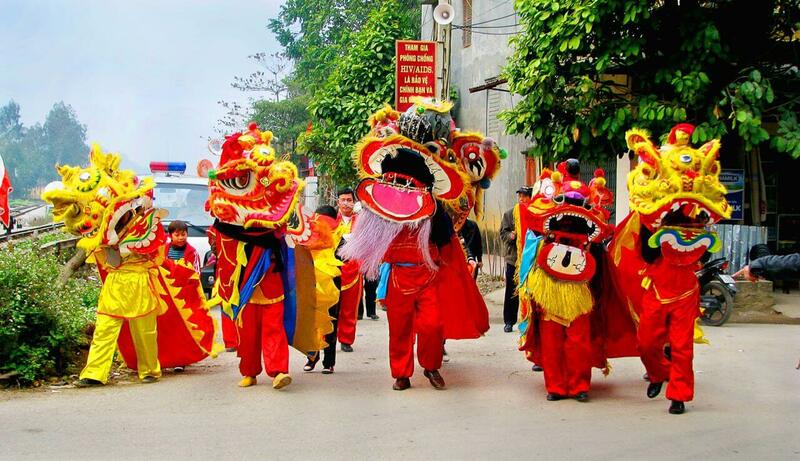 Vietnamese believe that dragon dances ward off devil spirits. Vietnamese people are sure, that it is good luck to spend New Year time in the company of an old person, especially if the person is seventy or older. At midnight children congratulate their parents, grandchildren congratulate their grannies and granddads, all wish them health, prosperity, long live. Parents and grandparents, in turn, present envelopes with money to their children and grandchildren. It doesn’t matter, how much money is presented – it is important only, that banknotes should be new. 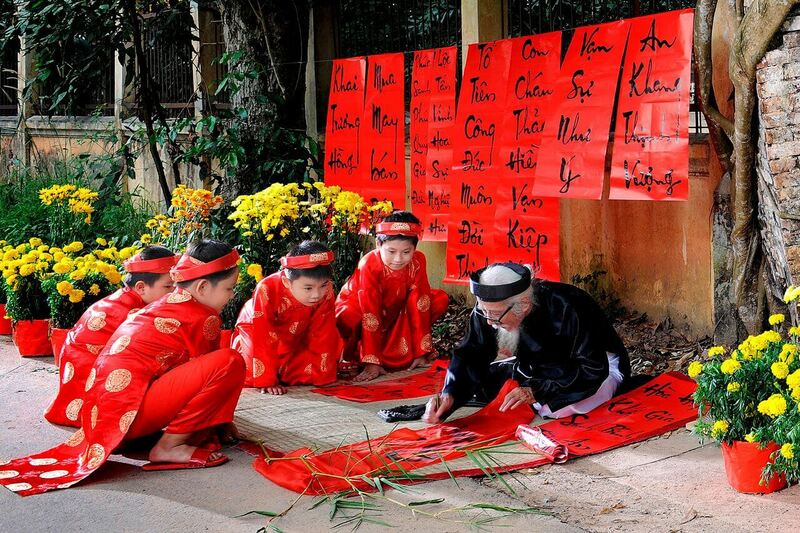 Vietnamese believe that it is good luck to celebrate Tet with a person of seventy or older. After celebrating New Year with a family, it is time to congratulate the other relatives and friends. Everybody visits neighbours living on the same floor, after this they go to the other floor and so on. All doors are wide open, all furniture has been taken out in advance in order to have much space for guests. Anybody may come in, congratulate the masters of a flat (or a house) and drink to their health. Guests are supposed to bring good luck. Any guests should present the masters money in traditional red envelopes. It can be a small amount of money, but this is a very old tradition and it is kept every year. All dress up in fine holiday clothes. 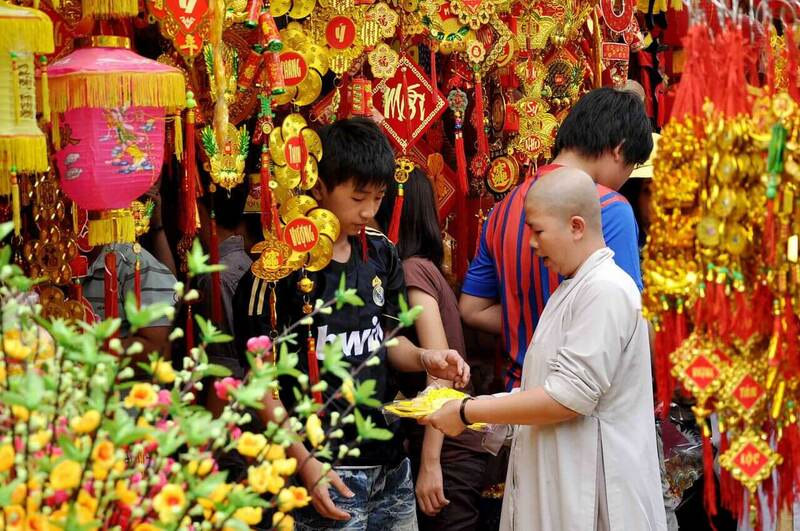 According to Vietnamese traditions, all people go to the temple in the morning on the first day of New Year. After that all come back to their houses, sit at the tables and eat a traditional Vietnamese dish – Bánh chưng or Bánh tét. New Year food in Vietnam is being cooked mostly on charcoal. In North Vietnam the most popular Tet dish is Bánh chưng – a Vietnamese rice cake made from glutinous rice, beans, pork, onion, salt, pepper and other ingredients. Everything is wrapped in la dong – a Vietnamese plant with big green leaves. Meanwhile in South Vietnam an iconic Tet food is Bánh tét – just the same as Bánh chưng, but more sweet and wrapped in banana leaves. 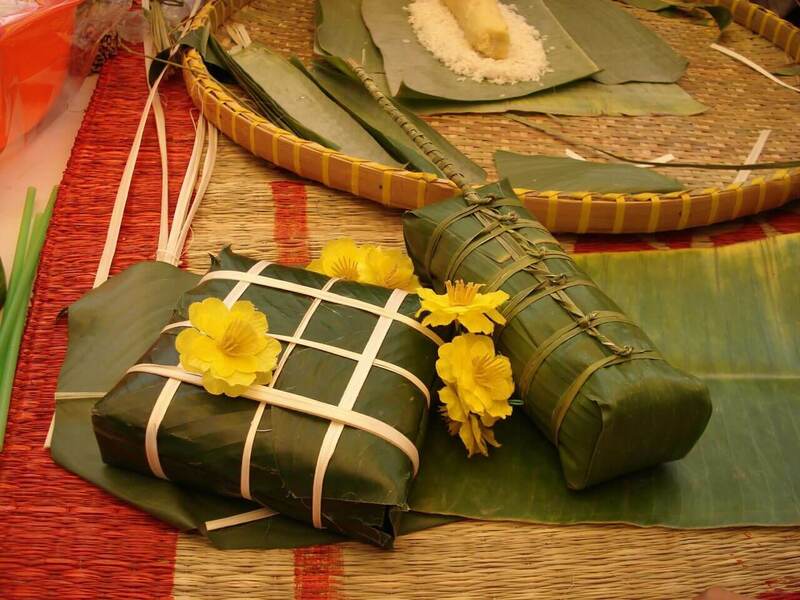 Bánh chưng and Bánh tét are fixed with banana or wood thread to form a more perfect shape. Bánh chưng should be square, Bánh tét is rectangular – both cakes symbolize Vietnamese people’s gratitude for their productive land, which gives them a bumper crop four times a year. New Year holidays in Vietnam last about a week. Most Vietnamese leave their apartments for visiting relatives and friends, streets are deserted, it is quiet everywhere in the evening. It is important to buy food before New Year holidays in Vietnam, because most shops and supermarkets are closed during Tet. 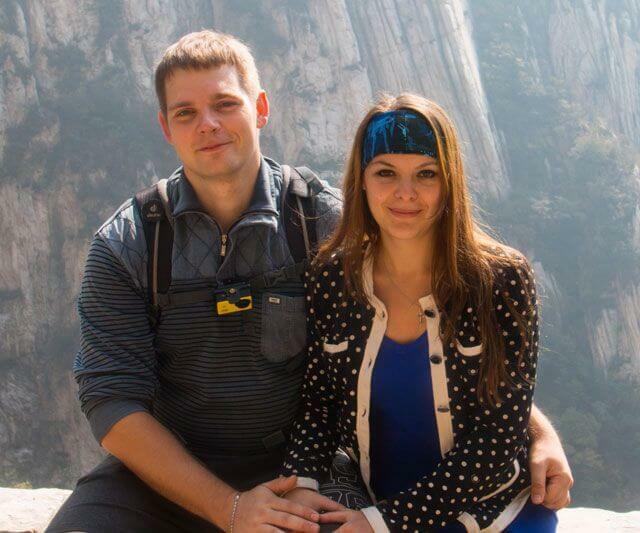 For example, in Russia you will find many working shops on January 1st, but you will fail to do it in Vietnam. That’s why please buy any food you need before New Year here, if you don’t want to stay hungry during Tet. Very important information: rent can be much higher at this period of time, some renters establish double price. Then, when Tet celebrating is over, the tax will be less as before New Year. It is just the same situation with renting bikes. 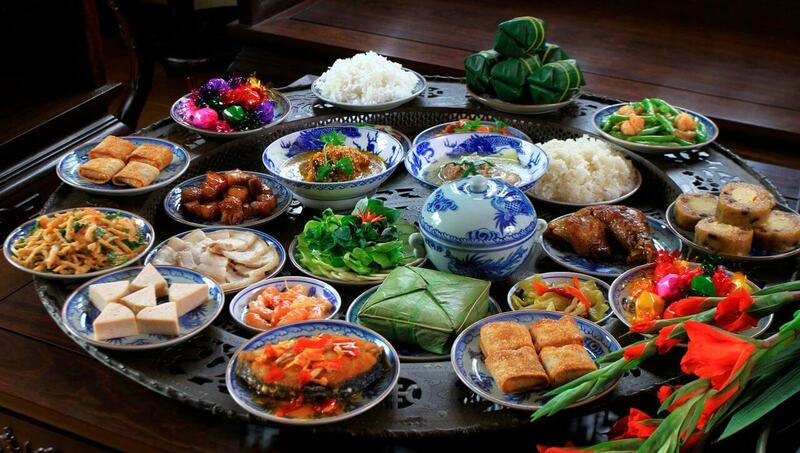 Of course Tet is a very interesting holiday: you can know more about Vietnamese traditions and culture, taste new dishes. On the other hand, everything is stopped during this period: you will not be able to visit any museum or to book an excursion. The only thing you can do during Tet time is walking along the streets. Anyway, it is better to arrive to Vietnam before Tet. You’d better visit sights and do shopping, see the beginning of this holiday and return home. Despite some discomfort during New Year holidays in Vietnam, of course it is worth seeing this cultural event.